We all know that using certain keywords and phrases can help boost your site’s SEO, but keyword optimization is just one part of the equation. It’s essential that site visitors find the relevant content they’re seeking. Otherwise, they’ll move on quickly. Attention to design and user experience (UX) are imperative when it comes to building your SEO-focused site. Here’s how you can develop a site that will attract visitors and keep them hooked. To help users quickly find what they’re looking for, your site’s menu must be easily navigable. Otherwise, they’re likely to lose patience and head elsewhere, which will reflect poorly in your bounce rate. Site navigation should also be intuitive. For every moment the user has to stop and think about how to get around, the likelihood of them leaving your site grows exponentially. Your menu should be straightforward and clean, but that doesn’t mean it needs to be unimaginative. 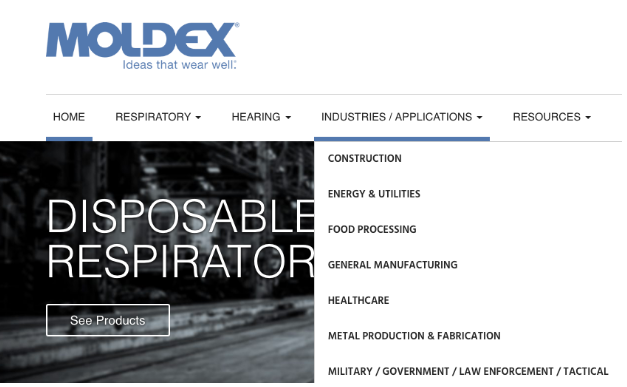 We kept this in mind for Moldex, a leading resource for respiration and hearing protection devices for professionals across construction, mining, food, and public sectors. Because products vary by industry standards, our web designers needed to account for a diverse range of web searchers and site visitors effortlessly navigating this client’s site. We addressed this by organizing a subset of categories by industry, featuring keyword-rich content directed to searchers in these professions. Respirators and hearing protection devices are also organized by broader product intent and type specifications, facilitating easy navigation for visitors regardless of how they arrive on the site. For Vault Energy Solutions, our efforts focused on lead generation. Vault helps Texas residents identify affordable energy providers in their areas. As services and content are location-specific, our team implemented a robust internal search feature that allows visitors to input zip codes to quickly direct them to the most relevant provider information. To present users a clear list of options, be sure to give them a deep menu rather than a wide one. Odds are, your website has too many pages to fit every option on the primary navigation menu. Your best bet will be to build a deep menu that will give a handful of categories with subcategories under each title. There’s wiggle room here for creativity, but a direct and straightforward layout is what you want when the customer’s eye first catches the menu. Given the short attention span of the average consumer, fast load times are a must. In addition to using a reputable host company, site owners would also do well to avoid large or superfluous images. Page speed and load times may seem like minor issues, but they’re not. Even a one-second lag can result in the loss of valuable customers. You can also cut down on your site’s load time by minimizing HTTP requests, using external hosting platforms for videos, and utilizing “lazy loading,” which calls for content above the fold to load quicker than the rest of your page. Your site’s internal search function should be easy to find while helping users quickly identify the products or services they’re seeking. Amazon’s search bar, for example, moves out of the header and entices consumers to start shopping instantly. To increase its visibility, it features a large magnifying glass icon – a universal symbol for online searching. Once customers start searching, a quality auto-complete function will further speed up their experience. You would also do well to have the search box prominently displayed on every page of the site, including 404 error pages, to hold the reader’s attention. Anchor text is the clickable copy in a hyperlink. SEO best practices recommend that anchor text should be directly relevant to the destination page linked. Nordstrom’s website does a tremendous job of this by linking to keywords that are frequently searched. Before Father’s Day, Nordstrom’s header displayed: “Father’s Day is Sunday, June 17. Shop Father’s Day gifts.” The text is simple, easy-to-understand, and will have improved odds of appearing in a prominent position among search results. Rather than haphazardly placing images across your page, you can design your copy around visuals to give your site a clean, cohesive aesthetic that’ll engage any reader. Apple excels in this arena, featuring crisp product images strategically positioned around descriptions for each item. Intelligently cross-linking between pages on your site can be useful for SEO as well as consumers. New visitors to your site may not be as singularly focused as you might think. They could find a whole host of other helpful material on your site with links to related articles, products, trending topics, and more. Case in point: The New York Times. The historic newspaper boasts a website that offers substantial value, not just in their reporting, but throughout a network of intuitive links to closely-related content in the bodies of each article and on each page. With many options available online, you’ll want to give your site visitors and customers a variety of implicit reasons that incentivize them to stay, explore, and invest in your products or services. By offering intuitive, easy access to the right content, you can hold their attention in the vast ocean of competitors. Jordan Brannon is the president and COO at Coalition Technologies, a Los Angeles based digital agency that focuses on Wordpress and Woocommerce design and development. Jordan and his team have earned their reputation over several hundred successful project launches, and are most known for their ability to blend cutting-edge SEO with cutting edge design and development.